Stephan and Jean-Claude started their day by receiving a couples’ massage from Beauty Direct, in the comfort of their Clifton apartment. After grooming and dressing, they were picked up by a luxury car to be taken to Table Mountain. They took the cable car up and were met by Andred, the marriage officer from I Do Weddings, and Sally from Weddings Abroad. Their ceremony was short and intimate, crafted around what was important to them. 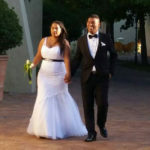 They exchanged vows and pledged their love to each other, before popping a bottle of MCC and enjoying sundowners. Heathyr from Heathyr Huss Photography spent two hours in a photo session which perfectly captured this beautiful moment. They ended their experience by dining in one of Cape Town’s splendid restaurants. Matthew and Jackie’s entire family were flying in from London to Cape Town for their annual summer holiday. The couple saw this as an opportunity to plan their nuptials. 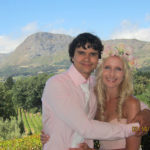 Matthew and Jackie chose to use five suppliers from Wedding Cartel, and managed the venue and catering bookings themselves. Sally from Weddings Abroad, created an intimate affair for them and their 40 guests. It was her experience and attention to detail that ensured the day was an effortless, and tasteful experience. Mist Make-Up enhanced Jackie’s natural beauty with a flawless look, while Heathyr captured the essence of the celebration with beautiful photography. Jackie’s gorgeous bridal bouquet and Matthew’s buttonhole, were created by Duke and Duchess. Because Jackie involved 5 Wedding Cartel suppliers, she received a discount. She was thrilled because that meant she could add to her package with a couple’s massage (and a mani-pedi for herself), with another Wedding Cartel supplier, Beauty Direct. The ceremony was breathtaking. 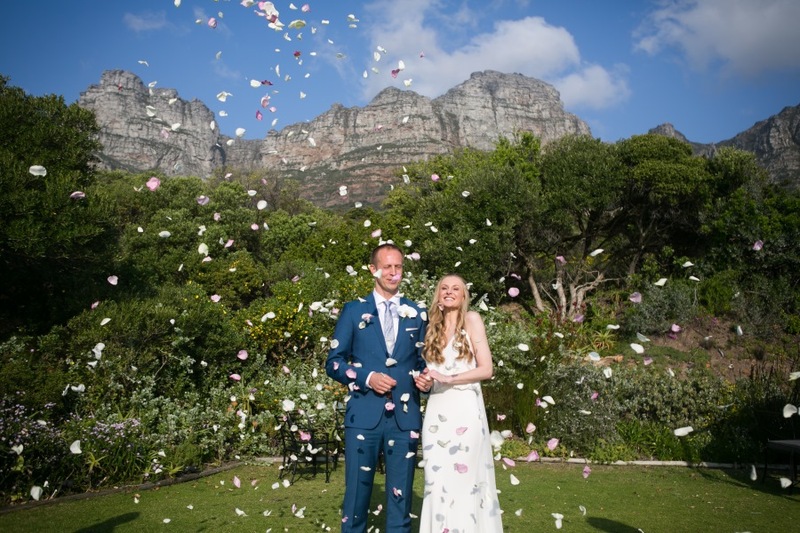 As Matthew awaited his bride under a romantically-draped gazebo, guests were spoilt with ocean and mountain views synonymous with The Fairest Cape. The couple shared vows during a simple, non-denominational ceremony that was created just for them. Their celebration carried on late into the night with good wine, great food and of course, family. 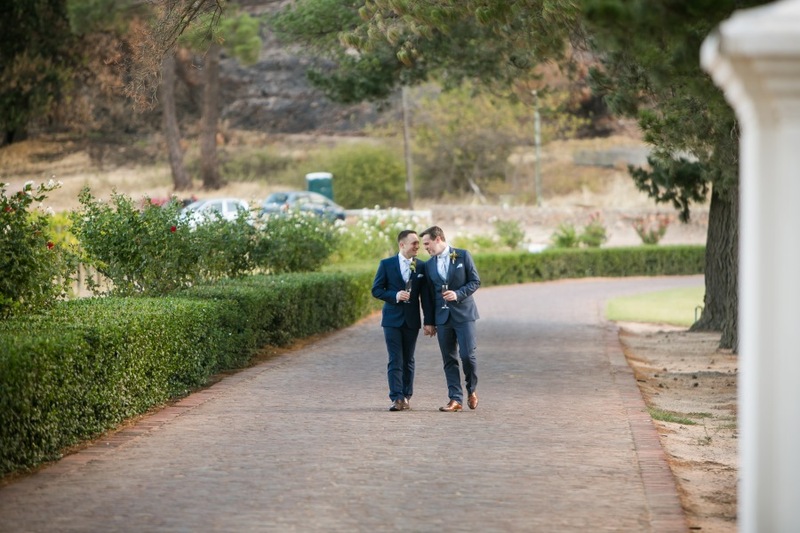 Brett and Colleen decided to tie the knot in a country setting in South Africa. Because they live in the UK, they knew they needed the help of experienced, local wedding suppliers who could manage the process for them. When they discovered the Wedding Cartel website, everything fell into place. They opted to use all of the Wedding Cartel suppliers. Sally, from Weddings Abroad, started to work on wedding plans a year in advance. As the big day loomed, Andred from I Do Weddings, secured the legal documents needed to ‘make it official’. An important element for anyone planning a wedding from another country. Ever the beautiful bride, Colleen booked manis and pedis as a thank you gift for all her friends. Beauty Direct surprised them at her hotel, there was no need for a trip to a spa. Hair and make-up was covered by Mist Make-Up (they specialise in air brushing so everyone looked flawless throughout the proceedings) . Heathyr from Heathyr Huss Photography captured the day – including the preparation, so the couple have memories to last a lifetime. 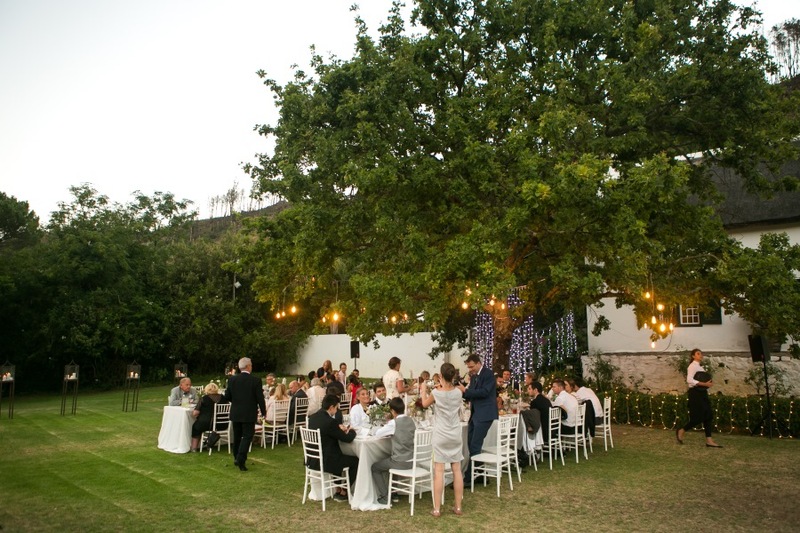 The venue was decorated in line with the natural surroundings. The pagoda was filled with fresh fauna sourced by Gerrit from Duke and Duchess, and the aisle was dusted with fresh rose petals. A colourful butterfly peaked out from the flower arrangements, in memory of Brett’s dad.. And the aisle was dusted with fresh rose petals. Even Colleen’s bouquet picked up on the natural hues of Cape fynbos. The couple were delighted by how the Wedding Cartel suppliers worked as a unit. That meant they could relax and enjoy the festivities, safe in the knowledge that they were well taken care of. 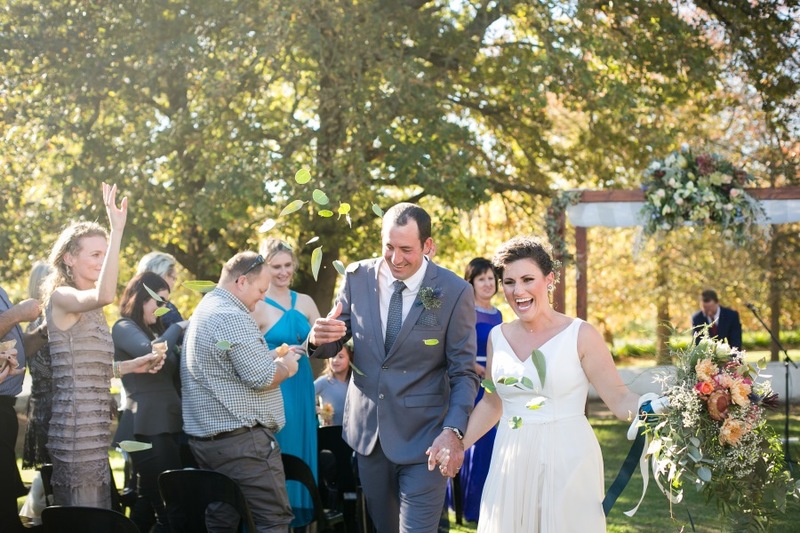 Victoria and Philip decided to create their magical milestone in the beautiful Cape Winelands. After finding Wedding Cartel, Victoria hired Sally as her wedding coordinator for their 120 guests. In the 18 months leading up to the event, Sally threw herself into the details – a venue was booked, which included the honeymoon suite for a two-night stay. Crockery, cutlery, glassware, linens, and napkins were included in the venue hire cost. Guests enjoyed canapés before the reception, while the couple had a photo shoot with Heathyr Huss, as well as a ballroom and ceremony area, creating a wonderful journey through the beautiful space. The couple enjoyed a pre-selected menu and wine tasting before the wedding for them to sample the food and wine pairings they had selected for their guests. Victoria booked a bridal package pamper day with Nikki and Zelda at Beauty Direct, and Talita and her team from Mist Make-Up looked after the bridal party of six people on the Wedding Day. Heathyr was booked for a full day of photo coverage. Andred from I Do Weddings provided a memorable ceremony under the beautifully decorated gazebo, and guests were in awe as they entered the reception with its elegantly decorated yet warm ambiance. White tables and benches with umbrellas were scattered outside on the lawns, creating a picnic feel, with Chinese lanterns floating above the dancefloor area. Sally’s full coordination included initial and follow-up meetings with the venue and the couple, as well as coordination on the day to ensure that everything was executed to perfection. She also secured the services of other providers, including live music, a gorgeous wedding cake, and many other details. Heathyr’s photography services included an engagement shoot, full-day wedding coverage, a photo booth, a hand-crafted wedding album and two smaller albums for the couple’s parents. Duke and Duchess created a gorgeous setting for the wedding. The ceremony setup included a gazebo, carpet, petals, and Tiffany ceremony chairs. They supplied bridal bouquets for the bride and her four-member retinue, as well as buttonholes for the groom and his groomsmen. They outdid themselves with the reception venue, setting up not only the table and reception décor, but also the stationery, dance floor, fairy lights, mood lighting and his and hers chairs and table settings for the couple.